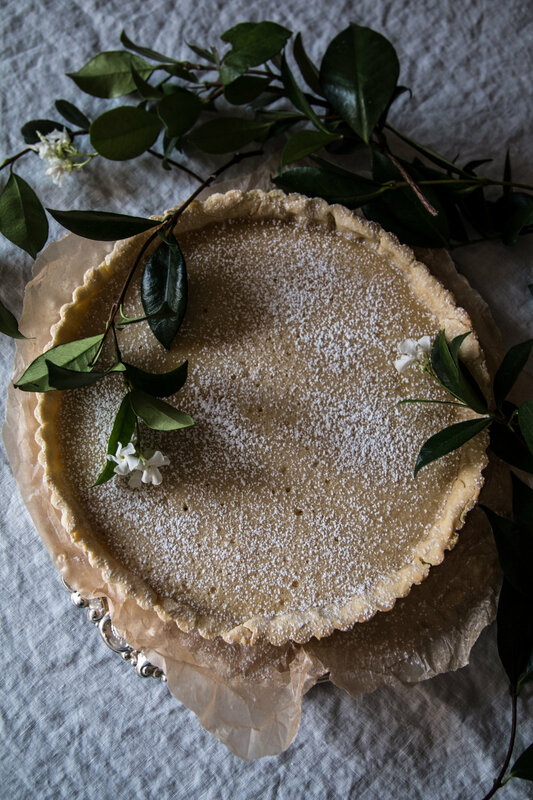 Crème fraîche, a French soured cream with a velvety texture and the slightest bit of tang, combines with a few spoonfuls of honey and a couple eggs to create this delicious, simple tart filling with a buttery crust to hold it all together. I think it's sometimes the simply flavored, lightly sweetened treats that are best. 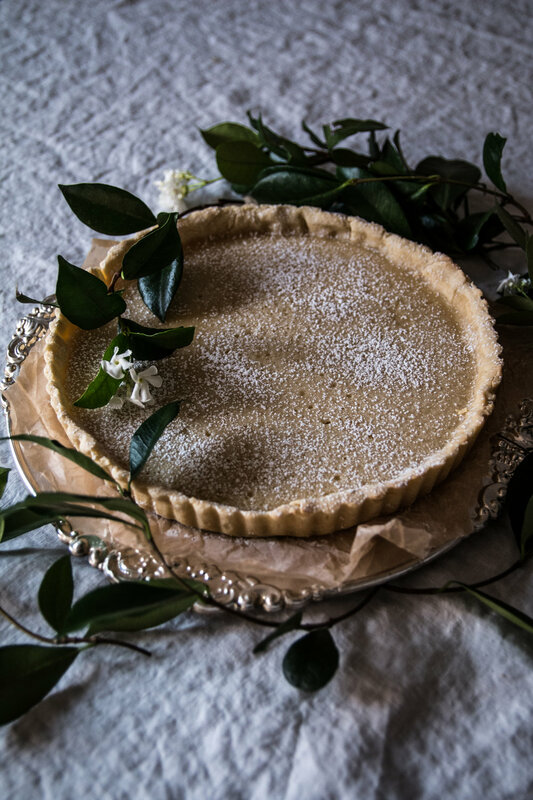 A crème fraîche tart makes for a lovely transitional season dessert, meaning its ingredients can readily be found and whipped together during transitional times of year rather than relying on strictly seasonal produce. September is just beginning now and before autumn's cooler winds blow in with her bounty pumpkins and apples and treats spiced with cinnamon, I find a simple dessert with a creamy texture to be just the ticket. If you happen to have some seasonal fruit on hand, this tart can also make a wonderful base for them. A handful or two of spring's strawberries or summer's blackberries are a welcome addition on top of the tart after it's been baked and cooled, and autumn's apples or winter's pears can be sliced and tossed on top of the filling then baked along with it, showered with a bit of powdered sugar at the end. If you like, you can trade the powdered sugar for a good drizzle of honey, or leave it off completely. After whisking the filling ingredients together, be sure to let it sit on the countertop at room temperature to allow the honey to dissolve completely. Because of the addition of crème fraîche and eggs, which are likely cold from being kept in the refrigerator, the honey may have trouble dissolving immediately. A good 15 to 20 minutes at room temperature while the dough is chilling should do the trick. While the dough is chilling, make the filling. Whisk the crème fraîche, eggs, honey, and vanilla together until combined. Slowly whisk in the flour a bit at a time, making sure there are no clumps. Set aside at room temperature - this will help the honey dissolve completely. After chilling for 15-20 minutes, place the tart dough into the oven, covered with parchment and pie weights to prevent the bottom from rising. Bake for about 10 to 15 minutes, or until the dough is dry to the touch. After baking, remove the parchment and pie weights, pour in the filling, and bake for another 30 to 35 minutes, until the filling has set. Remove the tart from the oven and cool on the countertop. When it reaches room temperature, dust the top of the tart with a bit of powdered sugar and serve. Store any remaining tart in the refrigerator.